Within 6 miles (10 km) of this Las Vegas hotel, you'll find University of Nevada-Las Vegas and MGM Grand Casino. Town Square Las Vegas and Thomas and Mack Center are also within 6 miles (10 km). This hotel features an outdoor pool and a fitness center. Traveling on business? Take advantage of the 24-hour business center, express check-in, and free airport shuttle. Guests will appreciate freebies like buffet breakfast and free self parking. The 128 guestrooms offer free WiFi and free wired Internet, LCD TVs with digital channels, and coffee/tea makers. Down comforters, free local calls, and hair dryers are also available. We are sorry that you had issues during your stay. The entire hotel stay was going great. The young lady who checked me in that night was amazing. Friendly, Professional, and accommodating. My only issue was I book Hampton INN for the great hot breakfast. Unfortunately, the employee who handles the Hot Breakfast didn't show for work and all we had was bagels, muffins, yogurt, and cold cereal. Other than that, my stay was fine. Thank you for your feedback. We are sorry that we were unable to provide a hot breakfast this past Monday. We will make sure staff is better prepared. Besides airport noise everything else very good experience. Rooms where loud. Maintenance going on during my visit. Thank you for your feedback. We are sorry you had noise problems during your stay. Pros: Proximity to the airport. Comfort. Cons: Everything was smooth on our end. Location: Las Vegas, but we really only came to Vegas to fly out of the area (Grand Canyon). The Pizza Company down the road is good. I have stayed at this same hotel several times. this was my only negative experience. The shower valve would not let you adjust to warm water. it moved from cold to full hot. a temperature in between was not possible. I resorted to running a bath of hot water, then adding enough cold to get it to where it was the correct temp. I told the desk manager about it when I checked out the next morning and I am sure they fixed it later that day. I had to leave quite early for a seminar at the Oquendo center. Nice hotel, near Las Vegas Strip and airport. Cons: Bed spread was soiled. Location: Near Las Vegas strip. Super close to airport and shuttle service was excellent. Staff is excellent and very helpful and pleasant. General hotel appearance and location is average to what one would expect from this chain. Big rooms with nice decor, very good breakfast buffet. Hampton Inn & Suites Las Vegas Airport offers its guests an outdoor pool and a fitness center. Public spaces have free wired Internet. A 24-hour business center and limo/town car service are available. Free breakfast is available. Event space at this hotel measures 1500 square feet (139 square meters) and includes conference space. A roundtrip airport shuttle is free (available 24 hours). The business-friendly Hampton Inn & Suites Las Vegas Airport also features multilingual staff, coffee/tea in a common area, and complimentary newspapers in the lobby. Free self parking is available. This Las Vegas hotel is smoke free. 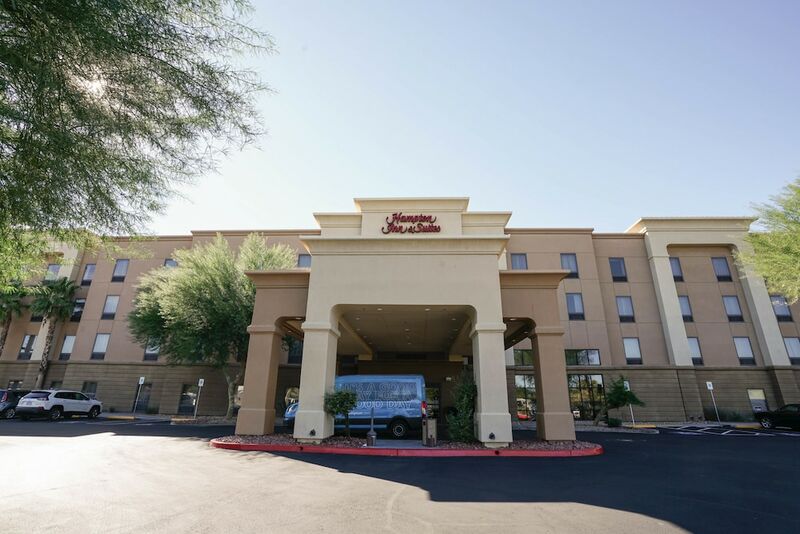 Hampton Inn & Suites Las Vegas Airport offers 128 air-conditioned accommodations with coffee/tea makers and hair dryers. Beds feature down comforters. 32-inch LCD televisions come with digital channels and pay movies. 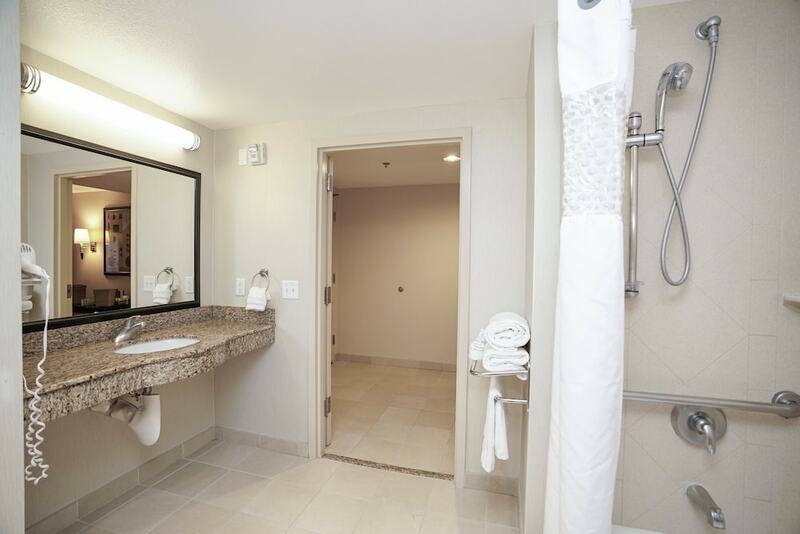 Bathrooms include bathtubs or showers and complimentary toiletries. Guests can surf the web using the complimentary wired and wireless Internet access. Business-friendly amenities include desks and phones; free local calls are provided (restrictions may apply). Additionally, rooms include irons/ironing boards and blackout drapes/curtains. Housekeeping is provided daily.